Aplia Econ Blog: News for Economics Students: The Doctor Will See You Now. Seriously. Right Now. The Doctor Will See You Now. Seriously. Right Now. Where smoothly functioning markets exist, they generally do an efficient job of answering the fundamental economic questions—what gets produced, how it gets produced, and who receives it. Not everyone will be happy with those answers, but there is efficiency in the sense that to make any person better off would require making at least one other person worse off. 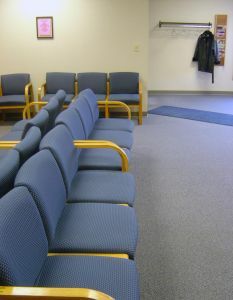 Such grandiose notions of efficiency may seem quaint when you're waiting, say, two months for a doctor's appointment. The market does not allocate when each patient is seen by a doctor—that scheduling is done by someone in the doctor's office, or (shudder) a bureaucrat working for the government or an HMO. No wonder, then, that scheduling nightmares are common. But even when markets cannot be brought in to answer questions—do you really want to have to bid to see a doctor in a timely manner?—other systems can be designed to achieve better efficiency. In a recent article in Slate, Marina Krakovsky discusses innovations in the way doctor's appointments are allocated among patients. In particular, a new system called "open access" or "same-day scheduling" reserves a large chunk of each doctor's time for patients who want to come in on the same day. If you were just starting a medical practice, using this new system would be easy. But the transition from the old system, which was plagued by weeks of waiting, is difficult. In economic terms, it means switching from an inefficient equilibrium to an efficient equilibrium. What does this mean? Well, think about the normal supply and demand model: strong market forces pull the system toward the equilibrium where supply and demand intersect. Similarly, trying to shift away from an equilibrium in which patients wait for months in advance means overcoming powerful forces. It means working overtime for several months to work down the backlog, and potentially turning away patients that would otherwise have been seen. 1. Suppose you ran a small medical practice and read this article. How would you go about deciding whether the benefits of the new, more efficient system would be worth the cost of transitioning to that system? 2. In a blog post about this article, Joshua Gans points out that "the no-waiting equilibrium is also fragile unless you have sufficient slack in the system—that is, on average more slots available than there is demand. This is because if you have a bad day, that creates a backlog, and this can feed back on itself so that waiting times slowly increase." What kind of "slack" can medical practices build into their system? How could they go about finding the optimal amount of slack? 3. The discussion of shifting from a system with a backlog to one without a backlog is somewhat applicable to the case of Social Security. The way Social Security works is that employees pay Social Security taxes, which go directly to retirees; the money isn't saved for the employee's own retirement. Many people believe that it would be more efficient to have individuals own personal retirement accounts. As in the doctor's office example, though, this would entail massive transition costs—the equivalent of all doctors working overtime to reduce their wait times, but on a much larger scale. Even if we assume that it would be better for people to have personal retirement accounts, how could we measure the benefits of increased efficiency against the transition costs?